An ignition coil typically runs from about 12 volts, and can generate sparks about 1cm max from this input voltage. 1cm sparks re boring though. Sparks several inches long can be created from an ignition coil (IC) by dumping a thousand volts into it. To do this, a special component called a SIDAC is used. This is a silicon device that blocks conduction, until a specific threshold voltage is reached, at which point it suddenly conducts fully, until current flow stops. It's similar to how a spark gap works. 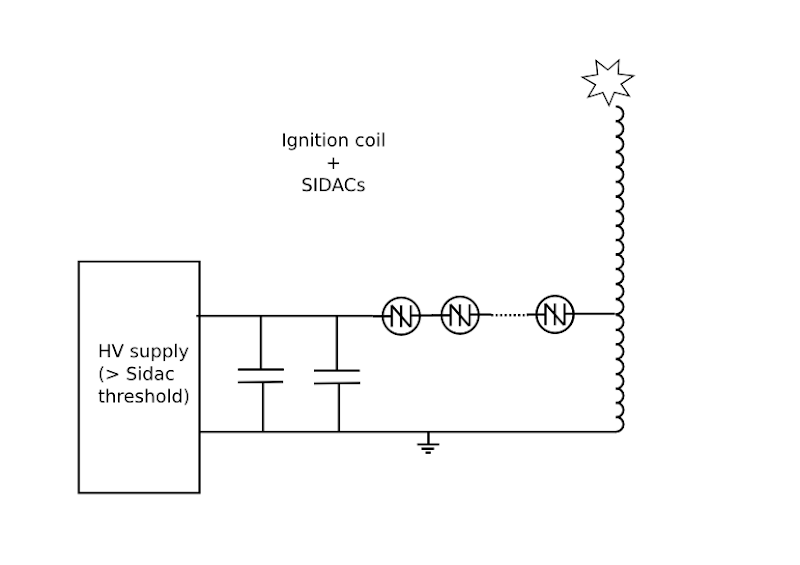 a threshold is reached, the SIDACs fire, dumping the energy through an ignition coil primary. The secondary then gives a pulse of around 40kV. ICs are not designed for this type of use, so could die, but most are usually ok for sparks of around 3 inches, as long as extra insulation is provided (PVC + silicone around the Hv terminal). I used a pair of microwave oven capacitors for it (hence 2 in the circuit). 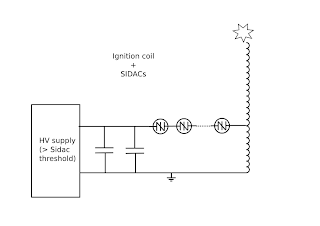 Each SIDAC is rated at 240v, and I have 8 in series, giving a voltage of almost 2000V into the coil primary. The HV supply is a simple flyback. In the video below, I also show it with a microwave inverter supply, giving a much higher spark rate. I am trying to build his circuit, but have only one question: Where is the base of that light bulb connected?? Open Bench Logic Sniffer "case"